2° BERTOLINI MATILDE (M.B. VICTORY TEAM A.S.D ) a 3"
3° EREMITA NOEMI LUCREZIA (TEAM DI FEDERICO) a 8"
4° CIPRESSI CARLOTTA (S.C. FORLIVESE) a 28"
5° BORTOLOTTI SILVIA (A.S.D.VO2 TEAM PINK) a 32"
6° BONZANINI RACHELE (INPA - SAN VINCENZO) a 39"
7° ROSSETTI SONIA (S.C.ORINESE ASD) a 42"
8° SCARSELLI LARA (CICLISTICA SAN MINIATO - SANTA CROCE SULL'ARNO A.S.D.) 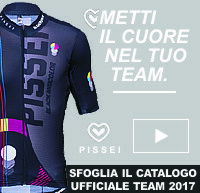 a 44"
9° FEDELI ELISA (INPA - SAN VINCENZO) a 51"
10° DONEGA' SARA (A.S.D.VO2 TEAM PINK) a 52"